Even today chicken is pretty inexpensive compared to other meats. We eat a lot of chicken. Not as much beef and quite a bit of seafood – Louisiana Gulf Coast is only 3 hours away. I make it many different ways but I have never been able to make a GOOD Roasted Chicken. I have tried it several times But not a whole roasted chicken. Well, on page 106 of Donna Hay’s modern classics Book 1 there is a roasted chicken. Simple! Nothing fancy, just a seasoned chicken dry roasted in the oven. How could I go wrong? Perfect!! Beautifully crispy on the outside. Moist on the inside. Just enough seasoning. I did not stuff the bird but rather filled the inside with onions, garlic, and salt and pepper. Just right. Mine was a 5 lb bird. At the end of two hours it was not done quite yet so I roasted it another 15 minutes. Donna lists 65 – 70 minutes for a 3.5 bird at 375. But it did come out beautifully. I need to either check my oven temps or up the temp to 400F. The recipe is a how to recipe from Donna’s modern classics Book 1. Page 106. Thanks, Donna, I can finally roast a chicken -well!! Actually, Donna’s recipe is garlic prawns but here in the Deep South they are shrimp. Same same! The theme this week for Wednesdays with Donna Hay was From the Sea. I am particularly fond of shrimp and would eat it every day if I could. Especially when it is this simple to put together. Peeled shrimp, with tails, sauteed in butter and olive oil with shrimp, parsley, salt and pepper. It doesn’t get any easier. And Donna suggests serving it with crusty bread and that was an excellent idea because you don’t want to leave behind any of that wonderful garlicy butter!! The recipe is from Donna’s modern classics book 1 (page 116). What did Kayte make. Visit From the Sea! I know I’ve said before that Indian Cuisine is my favorite. But I have to admit that anything with an Asian flair is right up there, too. I realize that most of what we get in our local Asian eateries (NOT the buffets) is not as authentic as we would like but I like what is out there – Tiny Spicy Chicken, Mongolian Beef, Chop Suey etc. Usually what I cook at home is much better. Like Donna’s Wonton Soup (page 18 modern classics) which fit Chaya’s theme of Super Soups just right. Light and fresh is perfect for a Spring day (in February). Ground pork mixed with green onions, ginger, hoisin sauce and sesame oil stuffed in little wonton wrappers. Easier than I thought to make. Cooked in a mix of chicken broth, soy sauce, ginger, and Chinese cooking wine. I don’t think I’ll be ordering this any more since it is so easy to make at home. There are more Super Soups on our Wednesdays with Donna Hay site. Several years ago I marked a recipe for this soup that I really wanted to make. And never did. In fact I completely forgot about it. Until I was looking thru Donna’s modern classics. Admittedly it’s not the original recipe I found but it was quite tasty. And filling. I was so afraid it would be rather bland since the only flavors added were sliced garlic, pepper, and basil leaves but I worried for nothing. Donna called for wood fired bread, not gonna happen unless I build an outdoor oven, and over ripe tomatoes. I had some good crusty bread in the freezer and some canned tomatoes. Since the tomatoes had already been peeled and canned they worked out perfectly. I only made 1/2 of the recipe but that was enough for 3 nice servings. Next time I will make more. Want to see more soup – visit Wednesdays with Donna Hay to see how the others liked my pick for this week. The recipe is on page 24 of modern classics. I also found it online if you want to try it out, too. I like tabouli. I would not have believed that until a few months ago when I finally had some GOOD tabouli. 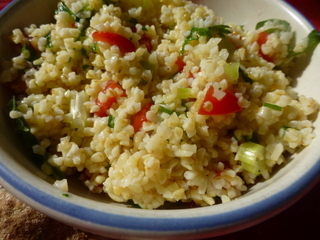 I had had many dishes of BAD tabouli. And by bad I mean no flavor at all. I have even made it before but it wasn’t very good. This time it was different. I was Donna Hay’s good tabouli. And it was easy to make. Especially since I actually had all the FRESH ingredients in the house: bulghul wheat, fresh mint, fresh parsley, fresh lemon juice, fresh onions, fresh tomatoes. Easy to put together. All you have to do is soak the wheat until it is hydrated and then all all the other ingredients. Perfect with just some pita bread or as part of a Mediterranean Feast. 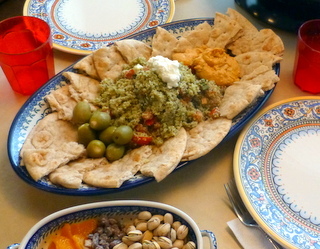 Served with some nuts, dates, pita, olives, humus, and feta it was a filling meal. Donna’s recipe is on page 46 of modern classics and my pick for this week’s Wednesday’s with Donna Hay. Check out the other’s tabouli while you are there. I will be the first to admit Donna Hay comes up with some interesting flavor combinations. Pasta and lemons? Ehhhhh…. But, folks, wrap that spaghetti around your fork ’cause this is GOOD stuff!! I was not expecting to like this AT. ALL. I was so wrong. 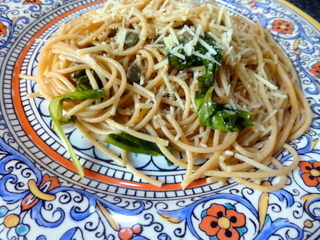 Slip on over the Wednesdays with Donna Hay and see how the others liked this pasta – Sarah’s choice this week. The recipe is on page 130 of Donna’s modern classics: Book 1 and I found it on Michelle’s blog, too if you want to try it. Any time you would like to join us just leave a comment on the WWDH site. Love to have you. My choice this week and I wanted something super simple. 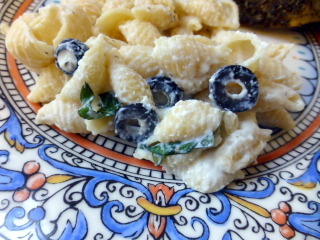 Ricotta cheese mixed with fresh basil, black olives, and parsley and then added to cooked rigatoni. The only change I made was to add some pasta water to the mxx so it wouldn’t be too dry. I have found that ricotta tends to dry out quickly. You can check with the other “Hayers” on the Wednesday with Donna Hay Website. Want to join us? WE cook from several of Donna’s books. Just leave a comment HERE! !